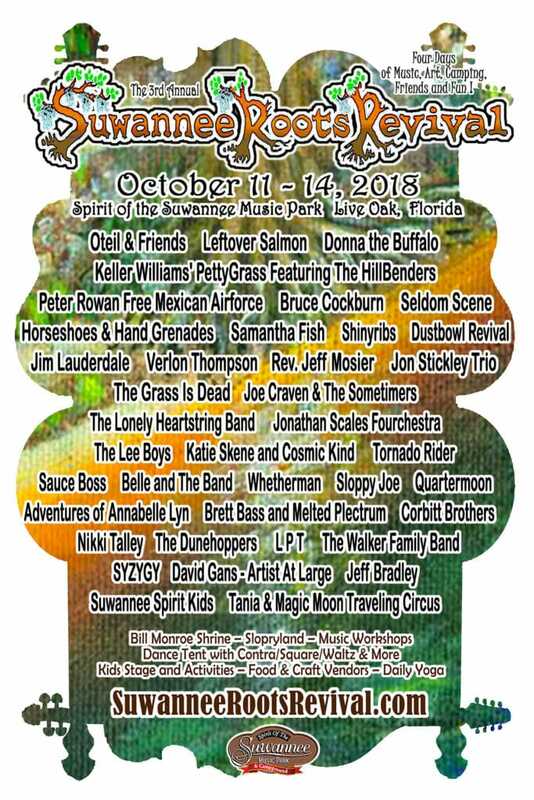 The 3rd Annual Suwannee Roots Revival takes place Thursday, October 11 – Sunday, October 14 at the magical Spirit of the Suwannee Music Park (SOSMP) in Live Oak, Florida. The stellar lineup includes Oteil & Friends, Leftover Salmon, Keller Williams’ PettyGrass Featuring The HillBenders, Donna the Buffalo, Peter Rowan Free Mexican Airforce, Bruce Cockburn, The Seldom Scene, Horseshoes & Hand Grenades, Samantha Fish, Shinyribs, Dustbowl Revival, Jim Lauderdale, Verlon Thompson, Rev. Jeff Mosier, Jon Stickley Trio, The Grass Is Dead, Joe Craven & The Sometimers, and more! With multiple stages (Amphitheater Stage, Porch Stage, Dance Tent, Music Hall, and Music Farmer’s Stage) Suwannee Roots Revival is jam-packed with stellar music and dance and many bands will perform multiple sets. This family-friendly festival includes four days of music, camping, yoga, music workshops, a Kids Tent, as well as campground pickin’ sessions. Set in the midst of 800 acres of Spanish moss-draped oak and cypress trees along the Suwannee River, the venue is a playground for endless activities such as swimming, canoeing, kayaking, disc golf, and biking. Oteil Burbridge will lead an all-star cast as Oteil & Friends featuring John Kadlecik, Weedie Braimah, Alfreda Gerald, Jay Lane, Scott Metzger [JRAD], and Jason Crosby [Phil Lesh & The Terrapin Family Band]. Oteil is no stranger to the Suwannee festival family, originally playing SOSMP with Aquarium Rescue Unit and Oteil & The Peacemakers back in the day, as well as his annual Allman Brothers Band appearances in April. With his current gig with Dead and Company going better than ever, he’s making new fans everywhere he goes and Oteil & Friends will bring his vast and varied experiences into what promises to be a transcendental set that will be long remembered. Leftover Salmon, also a longtime Suwannee favorite who has played multiple times over the years, is one of the great purveyors of Americana that dig deep into the well that supplies its influences; rock ‘n’ roll, folk, bluegrass, Cajun, soul, zydeco, jazz and blues. They will be traveling with a new album, Something Higher (released May 2018), in which they tap into everything from horn-blasting R&B to reverb-drenched desert noir, from the cosmic roots music sound they helped create to neo-New Orleans-meets-Appalachia liquefaction. We are so excited to hear some of the new tunes at Suwannee Roots Revival! The extremely talented and innovative Keller Williams has thrilled Suwannee audiences many times over the years and Roots attendees will remember The HillBender’s mind-blowing performance of “The Who’s Tommy” in our first year. Coming together as Keller Williams’ PettyGrass Featuring The HillBenders, they pay tribute to Tom Petty who was a Gainesville native, a great fit for Suwannee with sing-alongs that some people didn’t even know they knew! Donna the Buffalo, known for their distinctive, groove-heavy, and danceable music, serves as the pillar of our weekend and returns for three days! Donna the Buffalo has performed at Spirit of Suwannee every Spring and Fall for over 20 years and their songs are part of the living amphitheater itself always closing out the Amphitheatre Stage on Sunday bringing up a plethora of special guests musicians from the weekend! GRAMMY-award winner Peter Rowan is a singer-songwriter with a career spanning over five decades. From his early years playing under the tutelage of Bluegrass veteran Bill Monroe, to his time in Old & In the Way and his breakout as a solo musician and bandleader, and now his project, The Free Mexican Airforce, is flying again! This is Peter Rowan plugged in, a real treat! The Seldom Scene is an award-winning bluegrass band established 1971 and they have been instrumental in starting the progressive bluegrass movement as their shows include bluegrass versions of country music, rock, and even pop. The band has a long history with the Spirit of the Suwannee indirectly through the Cornett family’s iconic Festival of the Bluegrass held annually in Lexington, KY. Established in 1974 by the same family that owns SOSMP, this family-run festival is June 7- 10, 2018. The Seldom Scene will now bring their talented musicians, signature sound, solid repertoire and sheer sense of fun to Suwannee Roots Revival. One of Canada’s finest artists, Bruce Cockburn has enjoyed an illustrious career shaped by politics, spirituality, and musical diversity embracing folk, jazz, rock, and worldbeat styles. For 40 years, this Canadian musical legend has been capturing in song the essence of human experience – while fiercely striving to make it better for his activism on issues from native rights and land mines to the environment and Third World debt. Samantha Fish makes her Suwannee debut! She is a rising star in the contemporary blues world with sublime acoustic guitar skills as well as rootsy, emotionally resonant songwriting. This charismatic young singer-guitarist-songwriter has earned a reputation as a guitar hero and powerful live performer. Known nationwide as a purveyor of literate, improvisational folk-rock with looping, singer/songwriter/producer/photographer/author David Gans has composed, performed, and written about music for the whole of his adult life and Suwannee Roots Revival is thrilled to host him as an Artist-at-Large. He has been on the road this year with The Grass Is Dead and Rev. Jeff Mosier and we are excited to see who else he will be sitting in with! Gans will also broadcast his Sunday SiriusXM Radio Show, Tales From The Golden Road, live from the festival. Oteil & Friends, Leftover Salmon, Keller Williams’ PettyGrass Featuring The HillBenders, Donna the Buffalo, Peter Rowan Free Mexican Airforce, Bruce Cockburn, The Seldom Scene, and many more!